Happy Chinese New Year! Today is the first day of the Lunar New Year. LNY is an important festival in the Chinese (lunar) calendar. Family members gather on LNY’s eve to share the last meal of the year together. It is customary to eat rice dumplings on that occasion as its name (in Cantonese) “t’ohng Yuen” 湯圓” sounds the same as “together/same - round/circular”. In pronouncing the auspicious name of this dessert one’s wishes that it will bring her/him good fortune. It is only recently that I have been making desserts and yesterday was the first time ever I made rice dumplings. Here is the recipe I got from Bee Yinn Low with additional and useful notes from my friend Noel. In a large mixing bowl stir flour with water. Knead well. The dough must be smooth and should not stick to your hands. Add the water gradually and adjust quantity (depending on humidity). Divide equally into about 20 balls. Moisten your hands with water. Flatten each ball in your hand. Put a ball of sesame paste in the center. Fold the edge to seal the dumpling and roll it lightly into a ball in your hands. Toast seeds in frying pan – put lid on – until you smell the aroma. Grind the seeds in a food processor (I used my coffee grinder). Put grounded seeds into a small pan with sugar and butter; stir until all is well incorporated and form a thick paste. Put in fridge to cool down. Take 1/4 teaspoon of paste and roll into small balls. in a saucepan boil 5 cups of water with 200g sugar (or 1 ¾ slab of raw cane sugar) and 100g ginger (crushed) and cook until it reduced to about 4 cups. Put the dumplings in a large saucepan of boiling water; remove from heat as soon as they float. Then transfer them to the hot ginger syrup. Dumplings can be prepared in advance and frozen. Just put the frozen dumplings in boiling water and do the same as you do with freshly made ones. Sesame paste can be replaced with a tiny bit of crushed rock sugar, or raw cane sugar, or any other sweet paste of your liking. My comments: make the dumplings (roll the dough lightly into a ball shape) as soon as you have made the dough. The dough must be soft and pliable. The paste should not be too cold so as to remain malleable. Don't keep the sesame paste too long in the fridge as it will become too hard to use. Yesterday evening after our last meal of the year of the dragon we took a break before our dessert. During this time guess what we did? Ha-ha!! Something we have to do at this time of the year. Yes, we prepared “Lai See” or red pocket money. It takes time to fill in each red envelope with a “new” bill. We wish that the persons who will receive them will have a happy, healthy and prosperous year of the snake. 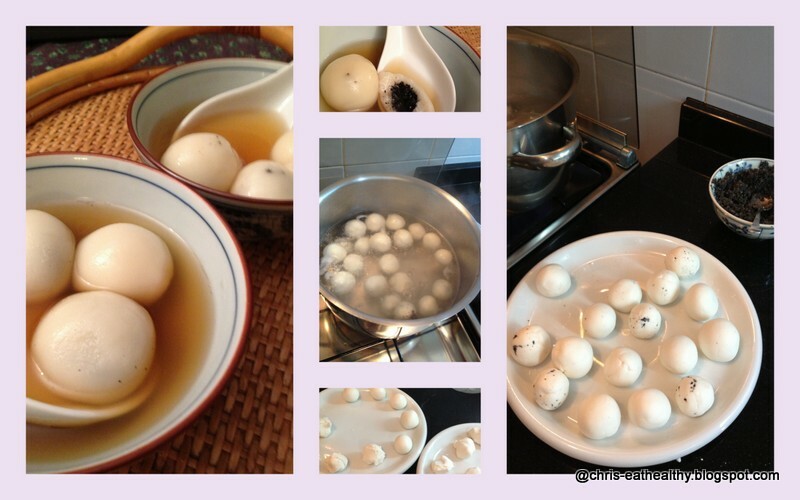 Once our annual task completed we finally enjoyed my 1st ever homemade sesame rice dumplings! I wish you all a happy, healthy and prosperous new year!